Welcome, if you are here then you are expecting a review of Best Gaming Laptop under 1500 dollars and I am here to deliver, so let us get right to it. New Pascal GPUs from NVidia are here, but they aren’t cheap. Luckily if you are willing to spend $1200+ you can get your hands on the new GTX 1060 graphics card. Superior to the 980m, which was last years highest tier mobile card, by about 30%, the GTX 1060 offers awesome gaming performance at 1080p. All the recommended laptop below are sporting it. One thing to note is that they aren’t listed in any particular order, they each have unique pros and cons. With that said, let’s get into it. This recommendation is probably one not many people have even heard of. But Clevo makes a lot of gaming machines sold under a lot of different brands. In the United States this laptop is sold as the Sager NP8152. So what makes it worth a look? The Clevo P650 chassis (which also has a GTX 1070 variant) is a subtle looking gaming machine(for those of you who might want to use it for business and pleasure and don’t want to seem unprofessional with a flashy gaming laptop in hand). The chassis is all metal, with an admittedly flimsier plastic lid. But the internal hardware, is powerful and open to a lot of customization. Sporting a standard i7 6700HQ and GTX 1060 it also includes a lot of flexibility for RAM and storage. It contains four ram slots, two under the keyboard (which are normally filled first) and two easily accessible ones under the backplate. Here’s where things get even more interesting, the P650RP6 can sport four drives. Two M.2 slots (one PCIe NVMe and one SATA) and two 2.5” bays let this laptop hold a ton of data, in any configuration you can imagine. It also sports two USB 3.1 Type C ports. It also sports three fans for exceptional cooling for a machine that comes in at just under 1 inch thick (.98”). Also standard is a 1080p GSync IPS display and RGB keyboard. The NP8152-S comes with a 250GB ssd + 1TB HDD, along with 16GB of RAM for just $1399, which is a great configuration for gaming. It’s main selling points versus the Clevo is that it’s thinner at .92” and quieter by a few decibels under gaming load. It also has a much flashier chassis with black and orange styling that some gamers may prefer. One final note is this sports one USB 3.1 Type C port. MSI has three main lines, the GE, GS, and GT series. The GE is entry level, and not very well built, the GS series is their nicer thin line, but their GT series is the enthusiast high performance line-up. The GE62VR is not better than the first two recommendations in any way (including price), and the GS63VR runs hot and is over $1500. The GT62VR however, is a great machine. Built well out of a very solid metal chassis, it’s not as thin as the others at 15.6” but you get a much quieter and cooler running machine. If portability isn’t a huge concern this is the one to get. It sports an i7 6700HQ, GTX 1060, 1080 IPS GSync display, four RAM slots, two drive slots (one M.2 PCIe and one 2.5” bay), and an RGB keyboard. Again, it also contains a USB Type C port. The speakers on this machine are also far better than what the thinner Asus and Clevo offerings could fit with two better speakers and a dedicated subwoofer. If you’re a true enthusiast, the GTX 1060 is also an MXM-B card, meaning it can be upgraded to a GTX 1070 down the line, and possibly even further (though that part is still up in the air until Volta 11 series gpus are available) making it a potentially more “future-proof” machine. This concludes the recommendations for gaming laptops under 1500. A couple things to note are that each model has a 17” older brother if that’s your preference. The MSI GT72VR is great, as is the Clevo P670RP6. However, the Asus GL702 does not get a recommendation because it has very hot temperatures from most owners and reviews. Avoid any laptops with a 900 series graphics card unless the price is under 1100, as they just aren’t very good value anymore with the 1060 beating them so badly. MSI GE62: Too flimsy and poorly built, the Clevo and Asus are better. Alienware 15: Awful temperatures in the mid to high 90s Celsius are common on this machine, and it’s value isn’t good. A config within budget will either only have 8GB of ram, or no solid state drive. Neither are good decisions. The display also flickers annoyingly at low brightness. Gigabyte P55W: Again, not built very well. It’s better cooled but doesn’t provide any benefits over the Clevo or Asus to make it worth recommending. MSI GS43VR: This is a good option is you really need a portable machine. It’s small, well built, and packs a punch. Cooling is also impressive for a 14” machine with no throttling under gaming load. So, This is our list for best gaming laptops under 1500 USD, what do you think? are they good enough? did you decide which one you will buy yet ? Do you have one in mind you think I missed out on ?? Tell me all about in the comments below(I read each and every single one of them). Just for a reference to the website’s history, below is the original article. This is the best that we can find for this price so don’t look any further than the 700MSI-GE72-Apache-Pro-001-i7-6HQ. Intel Core i7-6700HQ, CPU Speed 2.6 GHz with Turbo Boost upto 3.5 Ghz. 1024 GB 7200 rpm Hard Drive, 128 GB, M.2 SATA Solid-State Drive. 17.3 Inch Full HD eDP Non Reflection. NVIDIA GeForce GTX 970M Graphics, Windows 10 Home, Video Memory 3G GDDR5. Because of the GPU (Graphic Processing Unit) – a specialized CPU for Graphics (this is what makes a gaming laptop great). With it you will be able to play most of the newest games with high fps. Great screen with vivid colors and amazing viewing angels. The fan can be turned to max by a press of a button. There is almost no programs pre installed that might slow this beast down(except maybe Norton but you can un install it in a min). The 6th Generation i7Core with 16GB of DDR5 and SSD Makes it hard for you to make this gaming laptop slow down or lag. Finger print magnet, if the look of your buttons of important to you this will be very annoying, aside from that it is a minor issue that you can clean of with a piece of cloth. Speakers come out the front, even though the speakers are amazing but coming from the front is a minor con as well. A little heavy weighting at 6 pounds, but I assume you are going to have it plugged in most of the time playing anyway. The battery life is not the best to say the least, so if you are planning to have it unplugged for long times it might raise an issue later on. Alienware AW15R2-6161SLV (a little over the 1500 mark but worthy of consideration). Intel Core i7-6700HQ 2.6 GHz (6 MB Cache, 2.6 GHz up to 3.5 GHz). 1TB 7200RPM Hard Drive, 128GB Solid-State Drive. 15.6-inch Full HD Screen, NVIDIA GeForce GTX 970M with 3GB GDDR5 VRAM. Windows 10 Home, Up to 8 hours of battery life. Predator TrueHarmony Premium High-Performance Sound System. Two Built-in Stereo Speakers and Subwoofer. It comes with NVIDIA GeForce GTX 970M with 3GB GDDR5 VRAM which is a very strong combination, and also has the previously mentioned Nividia G-Sync technology. The keyboard comes with a backlight, and you can choose to adjust the brightness for better visibility. It has 2 fans that do more than efficient job cooling the laptop without any sacrifice in performance. It looks awesome when the red LED light bar as well as the backlit keyboard glows in red when the graphic card is operating, which makes gaming even more fun. The Nvidia driver did not come pre installed but it is an easy fix and easy download able from the GeForce Experience. Battery life, it is not that bad, but not that great from general usage you can get a good 7 to 9 hours from it, but while gaming you can only get 4-5 hours out of it. Click on the image to see customer reviews and today’s price. Powerful 6th-generation Intel Core i7-6700HQ 2.6 GHz (up to 3.50GHz). 1 TB 7200 RPM HDD. 17.3-inches Matte IPS FHD display. Backlit anti-ghosting gaming keyboard with 30-key rollover for precise command and control in battle. 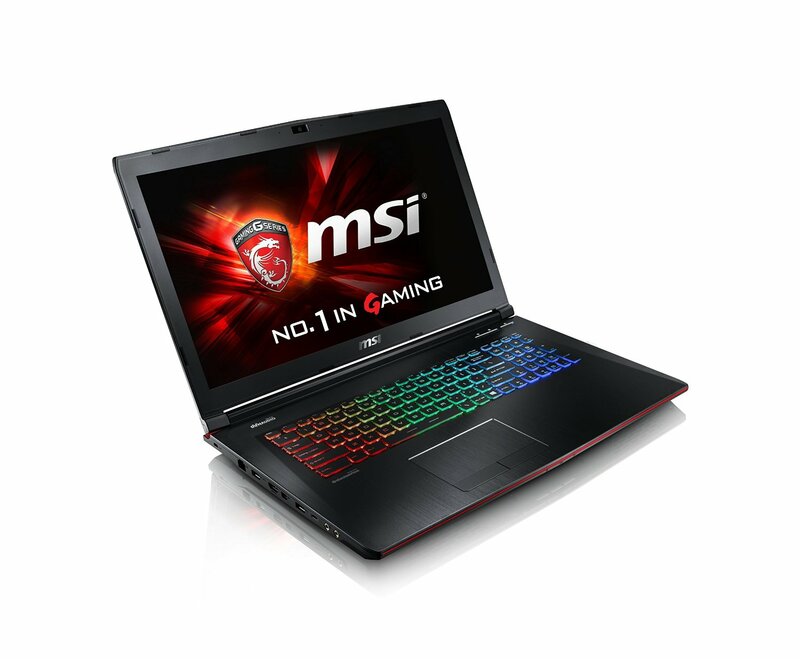 It comes with NVIDIA GTX965M 2GB GDDR5 with G-sync module, and as we agreed the GPU is the most important thing you look in gaming laptop but it also has the G-sync module (which is a technology that was deigned to help preventing lag). It has dual cooling fan system as well as copper heat which reduce the noise of the fan as well as increase its power. It looks Awesome with a great and new design. It comes with Efficient Dust-ReleaseThermal Tunnel which helps keeping dust outside your laptop and increase its stability as well as the components lifespan. It is also equipped with Intel Thunderbolt 3 which has transmission rates of up to 20Gbits/s – twice the bandwidth of USB 3.1. Does not retain finger prints, which is usually not available in most laptops. It has two expansion slots so it can even get better if you still want to spend the 1500 dollar budget. Wow that was a long list lol , so let us get right to the cons before you get too excited. Speakers, The speakers on it is no match to the price, most people will be plugging an external audio system. A lot of unneeded programs that can slow down the booting(pro tip if you are not planning to use them, removing the ROG Gaming Center and ASUS Sonic Suite should help resolve that issue). It is too big to fit most 17.3 cases, you will need a bigger case/bag. MSI GS60 Ghost-242 around the same specs(extra 128 SSD), but higher in price. The owner of this website, Beshoy Nabil, is a participant in the Amazon Services LLC Associates Program, an affiliate advertising program designed to provide a means for sites to earn advertising fees by advertising and linking [your site address here] to Amazon properties including, but not limited to, amazon.com, endless.com, myhabit.com, smallparts.com, or amazonwireless.com. Copyright © 2019 Laptop Legend. All rights reserved.